A Russian Soyuz rocket carrying astronauts bound for the International Space Station has taken off for the first time since a Soyuz rocket failed midair in October. Add Space as an interest to stay up to date on the latest Space news, video, and analysis from ABC News. American astronaut Anne McClain joined Canada’s David Saint-Jacques and Russia’s Oleg Kononenko aboard the rocket that launched from the Baikonur spaceport in the desert in central Kazakhstan on Monday. The launch had unusually high stakes following the accident in October, when a Soyuz suffered a malfunction around 2 minutes after take-off, forcing an American astronaut and Russian cosmonaut to eject about 30 miles above the earth’s surface. Spectators watch the Soyuz MS-11 spacecraft for the next International Space Station (ISS) crew, c is ready to be set on the launchpad ahead of its upcoming launch, at the Baikonur Cosmodrome, Kazakhstan Dec. 1, 2018. Following that accident, Russia’s space agency Roscomos suspended all manned Soyuz flights, cutting off the only way to get astronauts to the ISS. More than usual was riding on Monday’s launch, as NASA officials warned that if the Soyuz failed to reach the ISS this time, the station would likely have to be temporarily abandoned, leaving it empty for the first time in its 18-year history. While another malfunction was deemed highly unlikely, NASA engineers had made contingency plans for how to put the station into stasis, should it be left unoccupied. But the rocket launch on Monday went smoothly. Soyuz MS-11 took off at 5:31 p.m. local time from the Gargarin Start launch pad, and the Soyuz trailed a brilliant white tail as it roared up from the sandy steppe on a frigid evening with few clouds. The spacecraft docked safely with the ISS at 12.33 Eastern Standard Time, after a roughly 6 hour flight. Soyuz accidents are extremely rare -- only three manned launches have ever failed-- and as a result Monday second attempt to reach the ISS had attracted intense attention. But in Baikonur, the ritual-filled routine that precedes a rocket launch proceeded unchanged from the dozens of others that have been carried out by the Soviet-era spaceport. 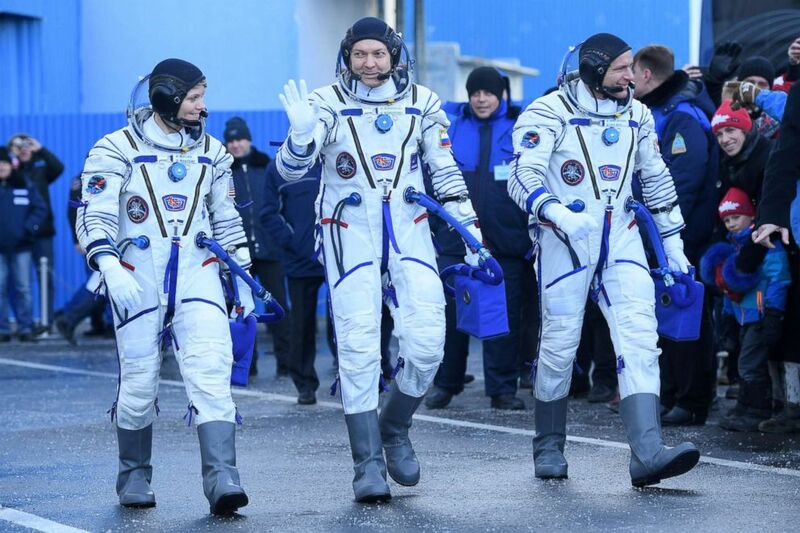 After walking out of their hotel to the sound of a Russian rock anthem and a crowd of about 100 tourists and locals who had gathered to watch, the astronauts were driven on buses to a diagnostics center. There, separated from relatives and media by a wall of glass, they were strapped into a Soyuz chair, and their suits were tested for pressure. Afterwards, they sat in their suits making small talk through the glass with family members under the gaze of a dozen cameras. NASA astronaut Anne McClain, Russian cosmonaut Oleg Kononenko and David Saint-Jacques of the Canadian Space Agency prior to the launchof the Soyuz MS-11 spacecraft at the Russian-leased Baikonur cosmodrome in Kazakhstan, Dec. 3, 2018. “I guess you can just think of it as you have less mileage to go than Seattle,” one of McClain’s relatives joked to her about the journey to the ISS, which is about 250 miles away from earth. This was McClain and Saint-Jacques’ first flight into space. Before joining NASA, McClain was as an Army attack helicopter pilot, and flew a combat tour in Iraq. The mission to the ISS -- the 58th using a Soyuz -- may yet bridge two eras in spaceflight, as next year, NASA looks to restart its own manned launches from the U.S. using rockets produced by commercial companies, such as SpaceX and Boeing. One of the new ISS crew’s tasks will be to receive an empty spacecraft launched on SpaceX’s Falcon 9 rocket, that is scheduled to take off in a first test flight for NASA’s commercial crew program in January. While that test flight may yet be delayed, NASA hopes that by the end of 2019 there will be a proven route to the ISS using rockets built by commercial space companies. 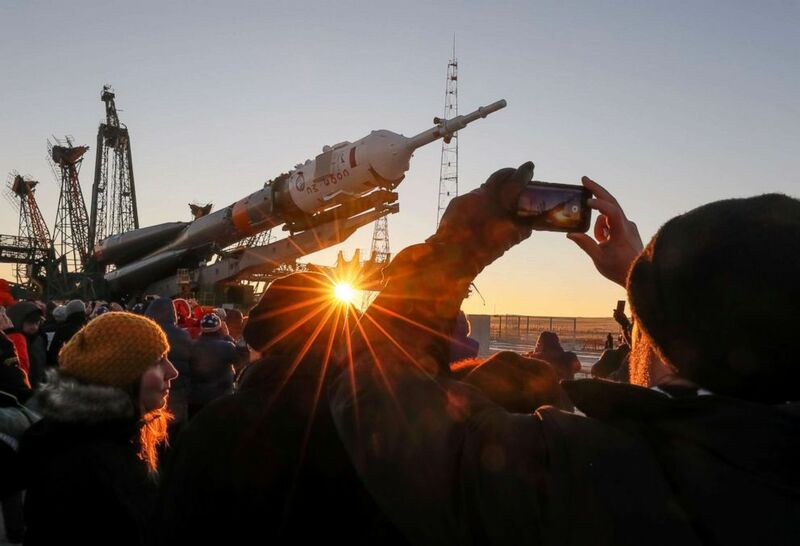 While that would mean fewer Soyuz rocket launches out of Baikonur, NASA has said it has no plans to stop Americans flying from the spaceport.